Here on the Eastern Shore of Maryland, we've been having one of the wettest and gloomiest spring seasons I've ever experienced. Thankfully this past week brought some sunshine and summer temperatures to ring in the summer season. Even though Memorial Day dawned rainy, humid and gloomy, we celebrated with a family cookout (Dad grilled in the rain, you can't keep him down!) and this fantastic summery dessert. Our strawberry season hasn't been great this year due to the monsoons that have been hitting us all spring, but I was able to find some salvageable ones at our local farm stand. 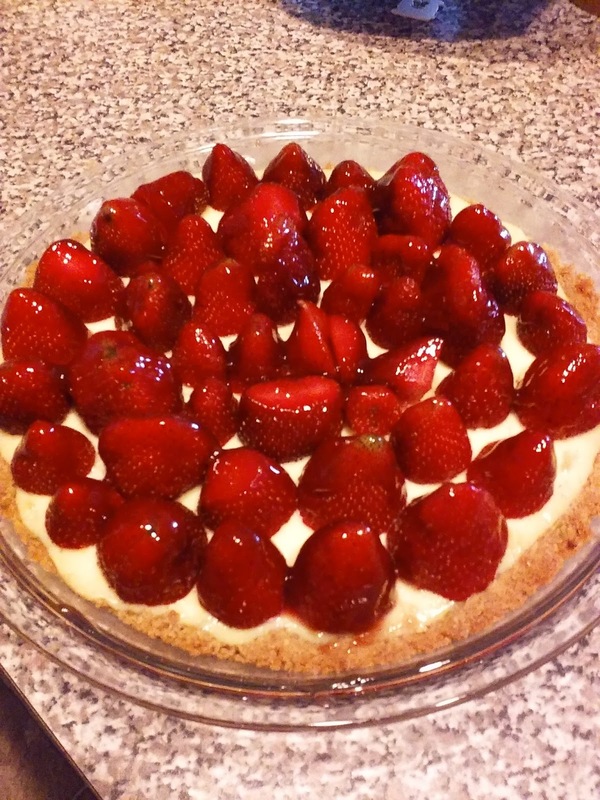 This pie blends two of my favorite things: key lime and strawberries, so I knew we couldn't go wrong! This simple, creamy and refreshing dessert was the perfect end to a meal of burgers, hot dogs and picnic salads. Hopefully it's sunny wherever you are and you're experiencing a better strawberry crop! Here's to the unofficially kickoff of the summer season - go forth and eat all that delicious summertime bounty of fruits and veggies before winter kicks in before we know it and we're back to squash and potatoes! Combine the graham cracker crumbs, sugar and lime zest in a bowl, then stir in the melted butter until the consistency is like wet sand. Press evenly into a pie plate to make the crust and bake at 350 for about 6 minutes until just starting to darken. Remove crust from oven and cool for 10 minutes or so while you mix up the filling. Whisk together the egg yolks and sweetened condensed milk until combined, then whisk in the lime juice and zest. When combined, pour into the slightly cooled crust and bake for another 20 minutes. Remove from oven and cool completely on a baking rack before refrigerating at least 5 hours or overnight. One hour before serving, remove the pie from the refrigerator and arrange strawberries on top and brush with melted jelly before returning to the fridge to set. Serve chilled.